Please refresh your screen Behruz Mofidi Shirazi, Behrouz Mofidi, Behrooz Mofidi, religionwhistleblower.com, rashad khalifa.
" Translate The Arabic Quran For Yourself "
Translators took out the name of " " from the Quran and replaced it with their own fake and false names.Therefore, Do Not Read translator's "Taffseer". 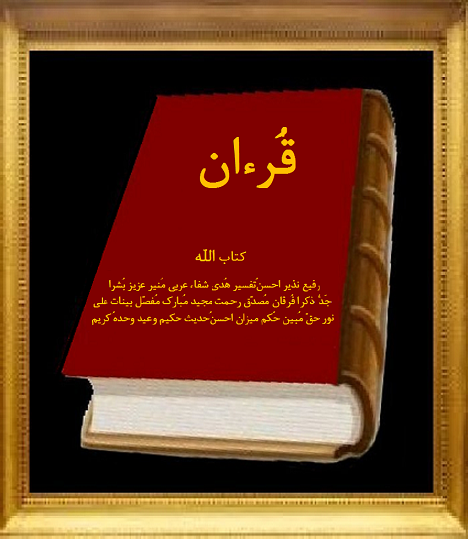 Do not be the slaves of Translations, they are only to deviate you from the Excellent literary composition of the Quran, and it's Perfect Poetry, plus it's hidden knowledge called "Hikmah", and true Sacred words of Allah, otherwise you would be a "Moshrik" by reading a book other than "The Book of Allah"
The Only Key To Understand The Arabic Quran Is To Have A "Pure Heart"
Here is another extremely important commandment which has been rejected by translators. In (2:174-176) we read: "Surely, those who CONCEAL what Allah has sent down in the book . . ." That means translators are Hiding the Excellent Literary Composition of the Arabic Quran, its Perfect Poetries, and its hidden knowledge called "Hikmah". Thank Allah for His unending "Hikmah"
Allah is the only Teacher of the Arabic Quran, and you have your whole life time to learn it as prophet Mohammad did days and nights hours on end every day for 23 years. Do not freeze youeselves in time by reading those Translations or "Taffseer"
As Allah says in (47:2,3, and 9) "Translators Hate the 'Arabic Quran' which was revealed to Prophet Mohammad, so as many other people, yet they Love those translations dropped on translators"
Before reading the Arabic Quran, we should seek refuge in Allah from rejected devil (16:98). (Remember we are not talking about translations of the Quran which was revealed by translators, yet we are only talking about the Arabic Quran revealed by ALLAH). "A Aouzo billaheh men al sheytaneh rajeem"
" Read in the name of your Lord who created" (96:1) In Arabic language. "Be esme rabby allazy khalagh"
Meaning in English : "In the name of my Lord , Who created"
And we should read the Arabic Quran in the arrangments which Allah decided for us, meaning from cover to cover and with both sequential orders: 1- Sequential order revealed to prophet Mohammad. 2- Sequential order destined for after prophet Mohammad. "In the name of Allah", or "With the name of Allah" the Rahman, the Rahim". Then Sura (9) "Beraat" does not have any "From Allah the Rahman the Rahim", simply because it is NOT just from Allah but, from "From Allah and His messenger". As we read in the first verse (9:1). Then the sequential surah numbers revealed to Mohammad. Then the sequential numbers destined for after prophet Mohammad. Also you will notice that the Arabic words has been separated from one another despite all the Arabic Qurans in the world, so one could easily recognize each Arabic word and translate it for himself or herself.